Titanium welding in a hyperbaric, inert atmosphere, in a dedicated welding chamber, is the only technology capable of producing joints whose mechanical properties exceed those of the base metal. 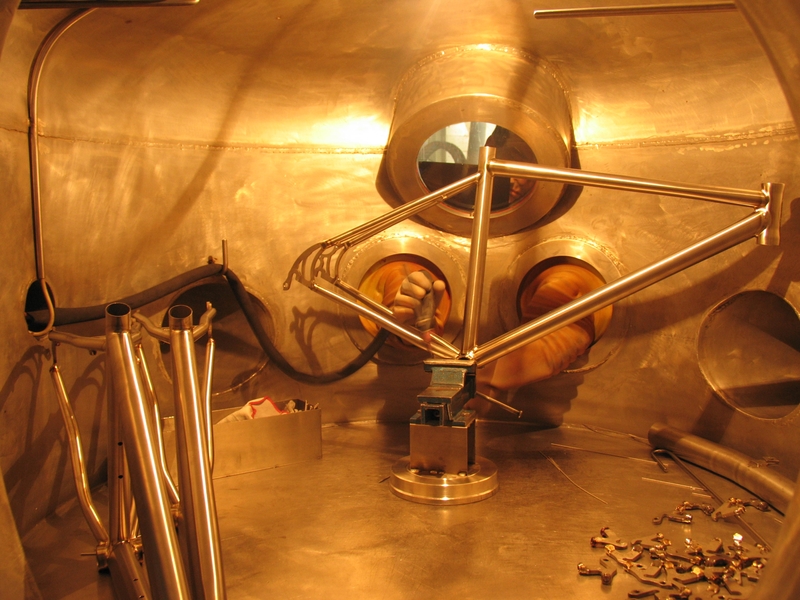 The procedure, which initially conditions all elements in a vacuum, first removes oxygen and hydrogen traces from components and the chamber’s interior, which would contaminate the welds. Then, an pressurized inert welding atmosphere is created in the chamber, and this promotes further purification of the welding area, as impurities diffuse away from the molten titanium. The weld may at this stage be widened to more than double (8-10 mm) of what is normally achievable with welding torches not inside a welding chamber (3-4 mm). The resulting joints, besides superior material properties, exhibit a fillet geomtery with greater impact and fatigue strength. Micrographic inspection confirms how gradually the material structure flows from one welded element to the other, a clear index of the superior fatigue strength.